According to press release from the Ukrainian state-owned export promotion firm Ukrinmash, the United Arab Emirates (UAE) and Ukraine signed a bilateral defence cooperation agreement. The agreement was signed during an official visit to Ukraine by a high-level UAE delegation from August 7 to 9. 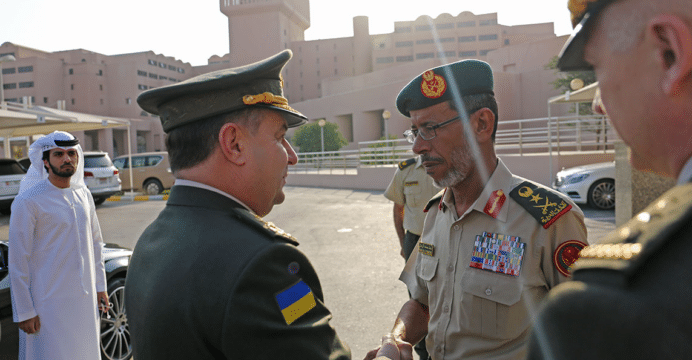 As per Ukrinmash, the two sides had agreed to explore cooperation in the following areas: the production of precision-guided weapons for the Emirati Army and Navy; the delivery of Antonov transport aircraft to the UAE Air Force; the production of unmanned aerial vehicles (UAV) and anti-UAV systems; and the joint production of electronic warfare (EW) and signals intelligence (SIGINT) equipment. Overseas partnerships serve an essential role in supporting the UAE’s goals for defence industry growth and self-sufficiency in certain areas, especially munitions sourcing and development. Emirates Defence Industries Company’s (EDIC) subsidiaries Tawazun Dynamics (e.g. Tariq precision-guided bomb kit) and NIMR Automotive (N35 mine-resistant armoured protection vehicle) built their respective product lines in collaboration with South Africa’s Denel SOC. Substantive traction in the UAE would provide UkroBoronProm with a second market in the region that it can collaborate with to bring incomplete and conceptual programs to fruition. UkroBoronProm is working with Saudi Arabia to jointly develop and produce the Antonov An-132D special mission aircraft platform. Ukraine is also seeking to utilize overseas partnerships as a means to drive the modernization of its armed forces and defence industry. Kiev has tasked the Ukrainian defence industry to develop and produce new weapon systems, including (among others) cruise missiles, UAVs and modern artillery. While traditionally reliant on the U.S. and Western Europe, the UAE has been working to diversify its arms supply channel by engaging new vendors. Its long-term aspirations include partnering with Russia United Aircraft Corporation (UAC) to develop a next-generation fighter aircraft.